A job is best when it doesn’t feel like work. 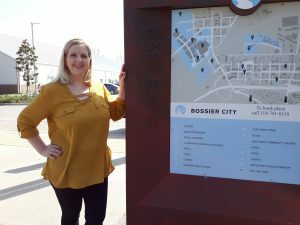 And for Robin Jones, executive director of the Bossier Arts Council (BAC), she says that her “work” is more of a mission. A mission to help an artist. Whether it is through support, brainstorming ideas, providing resources, or any combination thereof, Robin said helping give an artist the platform to go on and to create something beautiful is how she knows the BAC’s job is done. 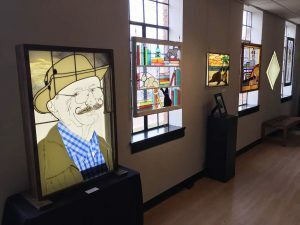 The BAC is a nonprofit that is passionate about the local talent in Bossier and strives to infuse arts and culture into the area. Robin notes that artists play many roles in the lives of others — improving cities, creating happiness, building bridges between cultures, evoking change and providing therapy. But she warns that running a nonprofit is not for the faint of heart. She likens it to being a runner — there is always another lap up ahead. Council. She notes that for a brief moment, before that next metaphorical lap starts, she can look back and see their impact. for its own neighborhood, the East Bank District. For many years, Robin said the BAC sat on Barksdale Boulevard with very few neighbors and had very little foot traffic during the week. That began to change when Flying Heart Brewing opened next door. With Retro 521 Cafe and BeauxJax opening in the district, the excitement and foot traffic has grown. It was only natural then that the BAC be hired by the city to take over managing events in the plaza that lies almost right outside their front door. One of those bigger events has become ARTini. The signature fundraiser for the BAC, ARTini is a martini competition that brings out the best local mixologists to create a signature martini that vies for People’s Choice, Judges Choice, and Most M’Artisinal. and beyond to support the efforts of the Bossier Arts Council. This years award winner is Steve Porter, a talented art teacher for Bossier Parish Schools. Robin notes that when she talks about the importance of the event, she points out a few of the functions vital to the BAC’s mission, which includes to change and upkeep three different galleries, teach classes, showcase artwork, provide outreach support, mentor students, write and administer grants, offer community events, showcase local artists, give tours to school children, run a theater, manage the East Bank plaza area, collect art supplies for teachers and coordinate Digifest South.